UNITED NATIONS, July 7 -- In defense of the UN Spokesperson's Office refusals to answer simple questions, it is sometimes argued that the spokespeople don't have the information and so can't provide it. But the stonewalling, even on who the UN pays and how much, is often intentional. Inner City Press: Dartmouth has put out a press release that Professor [Dirk] Vandewalle, an author on the topic of Libya, has been hired by the UN as a Special Adviser to Ian Martin. Is that true? And what type of recruitment took place, and what’s his compensation? Can you confirm that? Acting Deputy Spokesperson Haq: No, I don’t have a confirmation for that. You know that Mr. Martin is working on the post-transition work. If there is anything further to say about his team, I’ll let you know. But at this point, we don’t have any particular appointments to announce on that. Back in the UN's North Lawn building, a senior UN official approached Inner City Press to say that he found Haq's answer “pathetic,” that “everyone knows that Ian Martin invited Vandewalle to give a brown bag lunch presentation and then hired him.” The official, citing what he characterized as the Ban Ki-moon administration's propensity for retaliation, has asked that his name not be published. Going off the assumption that Haq simply hadn't known of Vandewalle's hiring on July 1, but would look into it and then confirm it, Inner City Press did not raise or write again about the issue for days. But nothing was said. Haq cut in to say that he had, in fact, refused to confirm it because “we don't publicly announce each level” of hiring. But why refuse to confirm the hiring of a Political Adviser on a topic like Libya, on which Ban Ki-moon has been assigned something of a supervisory role by Security Council resolution 1973? But Inner City Press hasn't trying to characterize Haq's “views” -- the request is simply that a spokesperson confirm or deny basic facts like who is being paid by the UN. Inner City Press asked, is Vandewalle being paid by the UN? “I'll see if we have anything to say,” Haq replied. While a senior UN official called this approach “pathetic,” we'll simply note that what is asked of spokespeople is not “views” or pre-packaged announcements, but timely answers to basic factual questions about the UN, including who has been hired as a Political Adviser, and how. We will continue on this. Acting Deputy Spokesperson Haq: That’s not what I said. Inner City Press: What did you say? Acting Deputy Spokesperson Haq: That’s not what I said. I said I don’t have a confirmation to give on that. I didn’t say it wasn’t clear. Acting Deputy Spokesperson Haq: We don’t publicly announce each and every appointment at each and every level of this Organization. For senior level appointments, as you know, we do make those announcements. Acting Deputy Spokesperson Haq: I think, much like what you said about my views, that’s a little inaccurate. The basic point is that Mr. Martin will have a team of people working with him, as he is entitled to do, and they would be paid. Inner City Press: Is Mr. Vandewalle being paid by the UN [inaudible]? Why refuse to confirm what Dartmouth announced a week ago in a press release? As UN Is Asked If Ban Notified of Arms into Libya, Says “Ask France"
UNITED NATIONS, June 30 -- The day after French armed forces spokesman Thierry Burkhard “said guns, rocket-propelled grenades and munitions were parachuted in to rebels in the Nafusa mountains” by the French government, Inner City Press asked UN deputy spokesman Farhan Haq if Secretary General Ban Ki-moon received any notification from France of its weapons drops. So Inner City Press reiterated the question, which is one of fact and not interpretation: has Ban Ki-moon gotten been informed by France, by means of the requested notification, of this weapons drop allegedly to protect civilians? “You could ask the government of France who they did or did not notify,” said Haq, Ban's deputy spokesman. This represents a total abdication of Ban of the role assigned to him in Resolution 1973. France's UN Ambassador Gerard Araud did not come to the UN Security Council on June 30 after the news broken, instead sending his deputy Martin Briens to decry Syrian lack of compliance with resolutions, even using the word “hypocrisy” without any seeming irony or self-consciousness. Inner City Press asked the chairman of the Council's Libya sanctions committee, Portugal's Ambassador Cabral, who said the "process has started,” referring to statements from the African Union meeting in Malabo. He indicated that the process would start in the sanctions committee upon the complaint of any committee member. 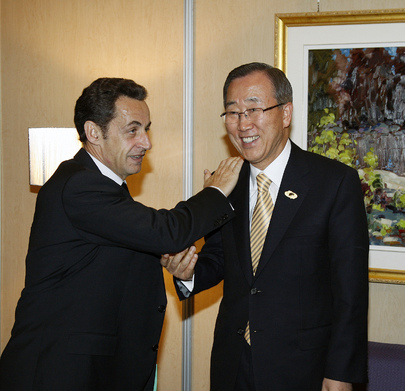 But that does not absolve Ban Ki-moon of the roles assigned to him in Resolution 1973. Did Ban get notification from France or not? Watch this site. Footnote: Haq was asked about the process for replacing departing top UN Peacekeeper Alain Le Roy and said that all member states can apply. Inner City Press asked Haq if the post is, as reported, reserved for France. Haq repeated, all can apply. Again, why would a country which now brags about violating a Security Council resolution be set to continuing heading UN Peacekeeping?